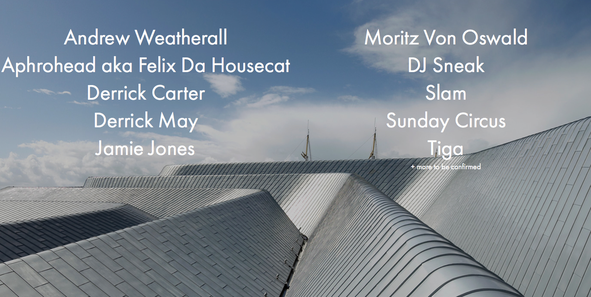 The Electric Frog and Pressure’s Riverside Festival in Glasgow, UK recently announced the first batch of acts on the line-up including Sunday headliner Jamie Jones plus Andrew Weatherall, Aphrohead aka Felix Da Housecat, Derrick Carter, Derrick May, Moritz Von Oswald, DJ Sneak, Slam, Sunday Circus, Tiga, Visionquest, Vitalic (live) will all appear over the weekend. Now increased to a two-day event, the outdoor music festival takes place on the grounds of the Riverside Museum and The Tall Ship, on the banks of the River Clyde over the May Bank Holiday weekend (3rd and 4th May) from 4pm – 11pm. The event will feature two covered stages, street food, a variety of bars and vintage stalls. Jamie Jones who, via his label, Hot Creations, has widely been credited with creating a sound that has paved the way for a warmer, more melodic, deeper side of house and techno to emerge. Jamie recently introduced his Paradise club concept to Ibiza which took the island by storm. Now in the second year, the organisers have worked hard behind the scenes to improve all aspects of the site. For the first time ever, there will also be the opportunity to purchase drinks tokens in advance from the festival’s web site, utilising state-of-the-art bar-code technology. The party is a day and night affair with the Riverside festival after-parties taking place at various venues in the city, with full details to be announced soon. Visit www.riversidefestivalglasgow.com for more information and ticket prices, which go on sale tomorrow at 9am.